Description: If you want to have a house close to big coastal resort, but in quiet and nice village, mark this offer. 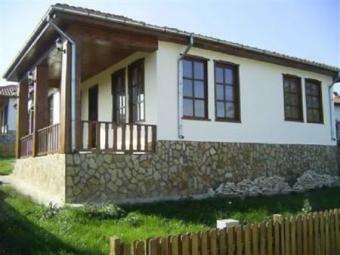 The property is located in village only 7 km from the Beach and 28 km from Varna airport. There are all the communications needed in the village. The region is ecologically clean. This is a small complex of three newly built bungalows located approximately 26 km from Varna. The houses are situated next to each other on a plot of 1200 square meters. The living-area of each house is 120 square meters and consists of three bedrooms bining high quality building and traditional Bulgarian architecture, each of these bungalows will give you the comfort you need to spend unforgettable holidays along the Black Sea coast. Only two similar houses are left for sale, the yards are separate. The total built-up area of each house is 120 sq.m., the area of the yard is 400sq.m. There are a living-room, a fire-place, a kitchen box, a porch, three bedrooms, a closet, 2 bathrooms and a toilet. There are electricity, water, a septic tank and an alarm system. The houses are insulated from inside and outside, with stones and mineral plasters. There will be a fence for each of the houses and a parking place. The house is finished with terracotta, parquet flooring, painted walls, wooden joinery, wooden doors. Features: - Fire place - Fitted kitchen - Satelite TV - Doorbell installation - Security - Equipped bathrooms. Once you visit this village you will be delighted from the peacefulness reigning in it and the opportunities it offers. Great proximity to the sea and to nearby vacation towns and places. Advantages suggesting good letting potential and unforgettable holidays!